One of the first pictures I did on deviantArt that took off was a silly picture I did of Lunch as a Super Saiya-jin. I thought I'd re-do this while I was bored listening to Hollywood Babble-On. 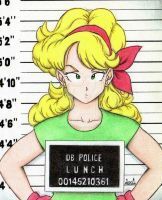 Naturally Lunch was created by Akira Toriyama. I got the idea from looking at Ganassa image. Launch is best girl. Someone remind Toriyama that she exists. Waaaaay back in the day, i read that this character was named "Launch." How did she go from Launch to Lunch? a little mistake, artwork good,i really think 18 is launch. hollywood babble on, nice. i always liked lunch from dragon ball. 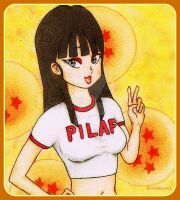 i cant help put wonder what dbz would be like if she appeared in it regularly. anyway, i like your lingerie/armor design for her.